Ulundil is an exceptionally cheerful Altmer ranger who runs the Windhelm Stables outside of Windhelm. He will sell you a bay horse with white markings for 1000 gold. His wife, Arivanya, takes over selling the stables' horses if Ulundil dies. He wakes up at 6am and has a two-hour breakfast with Arivanya, then at 8am heads outside to work at the stables. His workday ends at 8pm, and where he goes to depends on the day: on Tirdas and Turdas, he dines at Candlehearth Hall, staying at the place for around three hours before he goes home to sleep. On other days, he goes straight to bed. He wears clothes and boots and carries on him a Windhelm Stables key and some common items and gold. In combat, he relies on an iron dagger. Ulundil will greet you quite politely when he first meets you: "Oh, pardon me. Was I in your way?" He seems to be a very sociable person, as he will often tell you: "I hope someday we'll get to know each other better." Unlike many non-Nord residents of Skyrim, Ulundil seems to enjoy the cold climate: "I see why the Nords like Skyrim. This crisp air is wonderful for the lungs!" He may also happily say to you, "You seem like such a nice person. I'd love to hear more about you." You can ask Ulundil if he is worried about the dragons, to which he will reply: "My pa used to say there ain't no use worryin' about the things you can't change. If it's my fate to be ended by a dragon, so be it. Meantime, I'll live my life the way I want to." He may close dialogue by reminding you to consider buying a horse: "Sometimes the difference between life an' death is a swift steed." 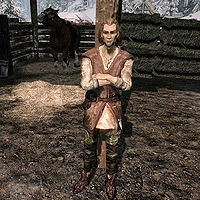 If he is inside the Windhelm Stables, he may also close dialogue by apologizing for the odor: "Sorry about the smell. It's a stable, after all." This page was last modified on 1 June 2014, at 22:58.